You have to give them credit for their ingenuity. 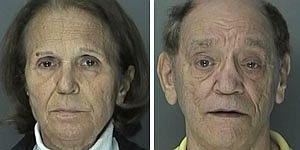 Alexander and Christine Clement, a pair of mid-60’s New Yorkers, had quite a little scam going. From their base in Long Island, they’d drive to local stores, buy 10 boxes of Jell-o Pudding (in pistachio or butterscotch), then return home. There they’d open the puddings, make them, eat them, and refill the bags with sand or salt and then return the resealed pudding to the store for a refund. The Jell-o Bandits struck four stores a total of five times, and bought 10 boxes of pudding each time. The couple are actually apparently well off. Authorities believe the scam is more due to some age-related mental issues on Christine’s part. So it’s not exactly as funny as it was when I started reading it, but it’s still a novel way to tamper with food. What gave them away was when someone bought one of the resealed bags and noticed it was just salty sand and not delicious Jell-O pudding.